With our new in-house digital printing capabilities, now we can be your one-stop shop for your printed sheets and binders. Stock clear overlay insertable view binders by Ad Industries are the perfect solution when it comes to presentation and quick customization. 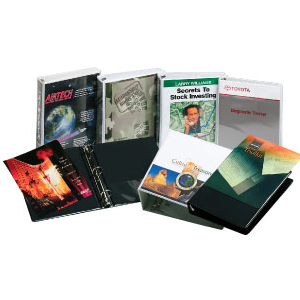 Our binders can enhance your company’s brand marketability when meeting with customers. What makes our Insertable View Binders Unique? The primary advantage of these binders is the clear overlay. It is heat sealed over the binder’s front, back, and spine. The top portion of the overlay is open, which allows you to easily insert colored cover sheets to market your brand. This means that you can change the cover sheets as and when you meet different customers. This method provides security by keeping the papers from falling out.